Why Is David Geffen Selling His $$$ Art? 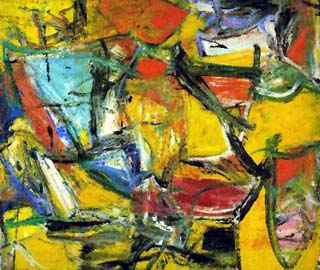 UPDATE: *Now there’s talk that David Geffen sold a third painting…* Is the mogul selling some of his spectacular art collection to amass a war chest to buy the Los Angeles Times from Tribune Co? Nice to be able to take two paintings off the wall and sell them privately to some hedge fund billionaires, then pocket a neat $143.5 million. 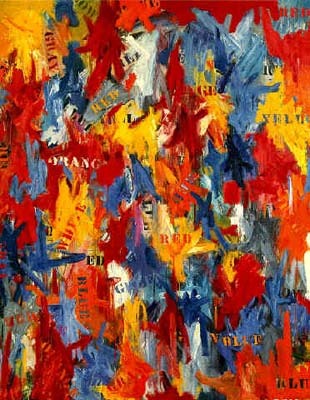 The New York Times reported that Geffen deacquisitioned Jasper Johns’ 1959 “False Start” (left) for $80 million and Willem de Kooning’s 1955 “Police Gazette” (right) for $63.5 mil. The new owners are Kenneth Griffin (who visited fell in love with the painting during an art tour of Geffen’s estate) and Steven Cohen respectively; both are building high-profile art collections. (For more on the showbiz-art connection, see my 2005 LA Weekly feature: Blame Ovitz: When Art Started Imitating Hollywood.) The prices bode well for November’s big auction sales, among the largest ever; Christie’s Impressionist and Modern art sale alone, scheduled for November 8th, carries a low estimate of some $300 million. “The sales are feeding speculation that Mr. Geffen is trying to raise money to buy The Los Angeles Times,” The NYT said. “But it is clear that like many other seasoned collectors, he is taking advantage of a red-hot market infused with money made by today’s crop of hedge-fund billionaires.” Actor Steve Martin, too, is said to be deacquisitioning. On the other hand, plenty of other Hollywood folk keep acquisitioning. At one art auction where New Line’s Bob Shaye was buying, he earned the nickname “shades” because no reporters in the room knew the identity of the guy in sunglasses who wouldn’t tell them his name.